Cut 8-inch round of parchment paper; place in bottom of air fryer basket. Spray with cooking spray. Cut potatoes crosswise into 1/8-inch slices, leaving about 1/4 inch of bottom intact. In small bowl, mix 5 teaspoons of the dip mix and the melted butter. Brush mixture all over potatoes and between slices. Place cut sides down in basket of air fryer. Set to 350°F; cook 35 minutes. Using tongs, carefully turn over. Cook 15 to 20 minutes or until potatoes are completely tender and tops are golden brown. Meanwhile, in small bowl, mix sour cream and remaining (about 3 teaspoons) dip mix. 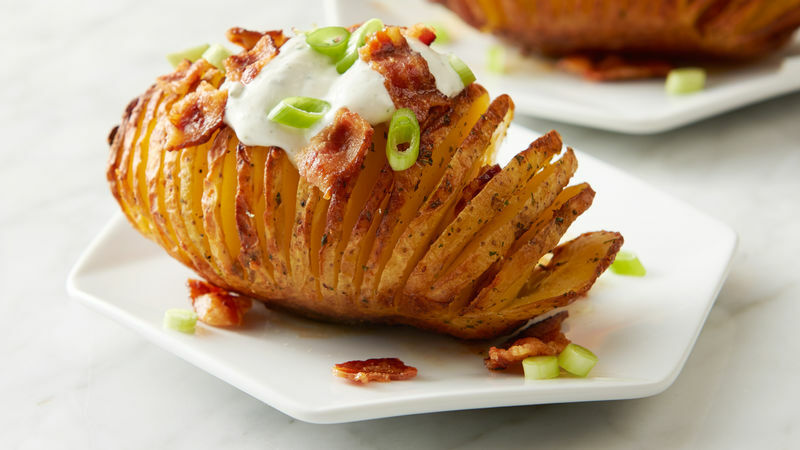 Top potatoes with bacon and green onion; serve with seasoned sour cream. An easy way to cut potatoes without cutting through is to place a wooden spoon adjacent to potato, and cut through until knife hits spoon.